Eurobonds have risen in price by 3.7 per cent in March. 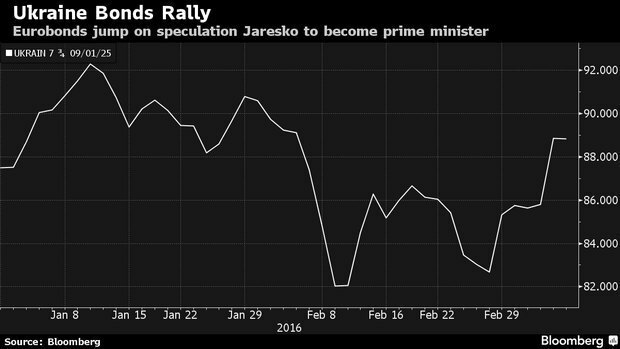 Quotations of Eurobonds in Ukraine have abruptly risen in price in March amid gossip that Finance Minister Natalie Jaresko will become a new Prime Minister of Ukraine, Bloomberg reports. According to the agency, Ukrainian Eurobonds rose in price by 3,7 per cent in March having almost regained the 4 per-cent-loss in February. Bloomberg recalls successful restructuring of the Ukrainian debt last year under Jaresko and adoption of the worked out by the Finance Ministry budget despite its unpopularity in the parliament. As noted before, reports on Jaresko to have agreed to head the "technocratic" Cabinet of Minister emerged in the media last week.